Former Real Madrid striker Gonzalo Higuain is on Jose’s wishlist after the Chelsea forwards fail to score in yet another game. Mourinho is reportedly looking to get a striker in January having previously stated that there won’t be any strikers coming in January, apparently Jose has had a change of heart. Higuian who was part of the title winning team under Jose at Real Madrid has been a star for Napoli so far but if Chelsea come calling Napoli will consider selling the Argentine for a whooping £48 million. 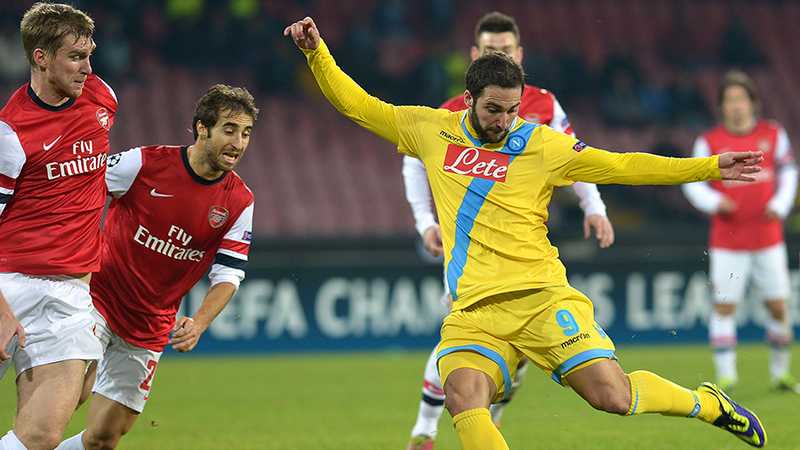 Gonzalo moved to Napoli after Arsenal failed to land him in the summer. The 26 year old has so far scored 13 goals in all competitions for the Italian side and will provide much needed firepower upfront. But is he worth this much? and would you like to see him in Chelsea blue? Let us know ..
Another player link to us. Napoli just dismissed this rumor. And @Emile… I like ur constructive contributions but man, you look like one who has a tendency of always imposing ideas & blacking-out the genuine pros & cons of others. Are you pursuing an unrecognized career on Chelsea football club analysis or is it your convictions? Slow down, respect this forum. Remember, your conclusion is not always perpetually right. I think most of the rumour is just distractions & shifting focus. What if we consinder availability of the players in the market , i gues Falcao won’t be available ?? In mind next season Lukaku i bet he will be a Chelsea fc team player & the next big thing infront of goal .. Who else can Cfc buy in January ?? I’m from Colombia and I know how well play Jackson and Falcao!!! Is true that Falcao is better than Jackson but you know how much Is the cost of Falcao!!! I don’t know who is going to be our new striker but the main idea is that we need a really good striker!!! Because Ba and Torres are onion!!! Etto is not good enough to be the first choice!!! Another thing is that our team have to feed our striker like yesterday versus Swansea!!! @ emilo u ar on point.or even diego costa.4 me higuian is not worth more than 30mil euros.rooney,suarez,aguero,costa,falcao wil be good.anything apart from these may be just another waste of mone@ emilo u ar on point.or even diego costa.4 me higuian is not worth more than 30mil euros.rooney,suarez,aguero,costa,falcao wil be good.anything apart from these may be just another waste of mone@ emilo u ar on point.or even diego costa.4 me higuian is not worth more than 30mil euros.rooney,suarez,aguero,costa,falcao wil be good.anything apart from these may be just another waste of mone@ emilo u ar on point.or even diego costa.4 me higuian is not worth more than 30mil euros.rooney,suarez,aguero,costa,falcao wil be good.anything apart from these may be just another waste of money. I prefer Diego Costa to Higuain. With that huge sum of money we should rather Get a prolific striker. This is a mere rumour though i doubt Mourinho will buy a striker in January am not raising my hope so high. Better still buy Martinez for the mean time in January. This transfer rumors are doubtful as I heard Chelsea wanted Costa,Falcao now Higuain but will Benitez a rival to Mourinho let live for chelsea? This transfer rumors are doubtful as I heard Chelsea wanted Costa,Falcao now Higuain but will Benitez a rival to Mourinho let him live for chelsea?